Finally, when patch is released, Crucible buff made this build Gladiator viable. However, it's somewhat slow due to natural lack of AoE in Blademaster class combo. Under Nature's Guardians you faceroll everything, but when it expires, try to avoid enclaves and Aleks meteors. Updated grimtools link and uploaded fresh videos. Last edited by veretragna; 05-11-2018 at 10:26 PM. 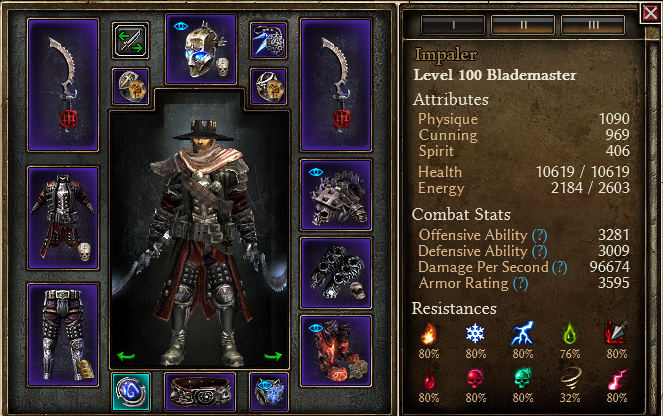 gonna switch my correct blademaster to this build. tnx a lot. In Myth Reaver's Claw, there's a modifier for Cadence: 1 Target Max. What does this mean? 1 extra target? Limit to just 1 target only? By dual-wielding it, does it increase to 2? This means each Cadence super-strike hits 4 targets (instead of default 3) if you equip one Reaver's Claw and 5 targets if you equip two of them. Might have change my blademaster to this class! Nice build. Who expected this hit from the past, huh? Yeah, that's it! Meet the reworked version of the Impaler - DW Pierce Cadence Blademaster. [1.0.6.1] Tears through Gladiator in 11 minutes. I love the Valdun, Belgo and Warborn, but among these three only Warborn has such high HP, Cadence boosts, flat damage and armor combined, other sets are worse here. About relic: Doom is better damage-wise, it has built-in armor, attack speed and Deadly Momentum craft bonus, coupled with Doomforce which is very good skill (converted to Pierce). That's why I think Doom is the best relic for Soldier, even Pierce.